As always, I return from a writing conference energized with all the new things I learned, interesting people I met, and fun moments with good friends. Probably not surprisingly, my NESCBWI 2016 recap includes all of those things. One of the best parts of the conference this year for me was meeting my longtime critique partner, Michelle Mason. Michelle lives in far-off Missouri, so even though we’ve worked together for years, this was our first time meeting in person, so you can imagine how cool it was to have real conversations for the first time! Scrivener with MarcyKate Connolly: I consider myself an intermediate Scrivener user, but I learned quite a few neat tricks as well as got all of my burning questions answered. Antagonists with Annie Gaughen: I have a thing for antagonists, and I was glad to learn that antagonists aren’t necessarily the villain. As an added bonus, Hamilton and Burr came up more than once. Which one is the antagonist? Verse Novels with Padma Venkatraman and Holly Thompson: I have been studying verse novels recently, so this class couldn’t have come at a better time for me. Both authors gave a great overview of some of the important elements in verse novels, along with so many wonderful examples to illustrate their points. My reading list has certainly grown! Counterfactual Fiction with Trisha Leaver: This workshop walked us through Trisha’s recent YA historical release, Sweet Madness, with an eye focused on weaving facts and theories together (all without altering the timeline). Such a unique way to attack historical fiction! Finally, even though I was busy stuffing my brain (and my mouth, since the conference food was pretty tasty), it was also great to take a break with the members of my #PitchWars family gathered for the weekend. So fun seeing you all. Until next time! Conference season is most certainly upon us, and I’m thrilled to be gearing up for NESCBWI 2016 this year. 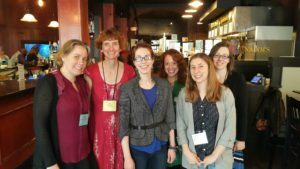 Last year, I chose the amazing Novel Writing Retreat at VCFA over the conference (so many events, so little time/cash/what have you), and while I hope to head back to that one again next year, there’s nothing quite like NESCBWI, as evident in my recap post from the last time I attended (in 2014). I have to say before even going how excited I am about the workshop offerings this year. I registered the first minute they opened and managed to get all my top choices, which focus on everything from Scrivener to verse novels to revision. So exciting! I consider myself a lifelong learner and always walk away from this conference with new tools tucked into my bag, so I’m already looking forward to all the new knowledge around the corner. Also, business cards! I haven’t gotten new cards in a while, so I figured it was time for some new ones. Of course, another thing I’m really looking forward to is seeing all my writing friends. In general, I prefer to hide out at home, but I do make exceptions for bookish events, and this one brings together so many of my favorite authors as well as fellow travelers on the path that it’s even possible for an introvert to enjoy. Perhaps best of all, I’m finally going to meet one of my longtime critique partners, Michelle Mason, in person! So who else is going? Let me know because I’d love to meet up! The annual NESCBWI conference in the spring is one of my favorite events as a writer. In my post-conference haze, I’ve been mulling over just how awesome it was, so here’s my top ten list! 10. Opportunities to fangirl. How often do you get favorite authors like Grace Lin, Sharon Creech, Nova Ren Suma, and Kate Messner together in one place? Um. It’s pretty cool. 9. Amaaaaazing workshops. There’s so much variety that there’s something for everyone. I absolutely loved Killer First Chapters with Nova Ren Suma and Real Revision with Kate Messner. 8. Great manuscript/query critiques. There’s always a nice full lineup of faculty offering up critiques. Definitely worth it for anyone about to query! 7. Bed-jumping. A new sport to me, but it was highly amusing to watch. 5. Meeting online friends in real life. This is just so cool, and it was awesome spending time with all of you! Check out Dee’s post for more about this and some fun photos of the gang. 4. The Blue Boarder dinner! Unfortunately I didn’t get a picture, but a bunch of us who frequent Verla Kay’s Blue Board got together for a fun dinner Friday night. Great way to start the conference off with a bunch of laughter and smiles. 3. Meeting and hanging out with Taryn, the one and only Girl With the Green Pen. 2. Getting my entire critique group together in one place. We’ve been working together for eight years now (gulp!) but this was the first time all four of us could get to the same event. Thank you, New England SCBWI, for putting on such a fantastic conference! And by NESCBWI, I mean everyone involved: the faculty, volunteers, and members. The energy in those keynotes and workshops was amazing. Meeting Sara Zarr, Kate Messner, Jo Knowles and Jane Yolen in person. There is nothing like chatting with an author you admire! What down-to-earth and sweet people they all were. Critique and craft. I got an in-depth, helpful critique from an agent–the effort she put into it amazed me! Likewise the information I learned in both the keynotes and workshops will stay with me as I return back home and begin writing and revising again. The Blueboarder dinner on Friday night. So fun to actually meet people in person I “know” from Verla’s, as well as make new Blueboarder friends! Finally, I cannot thank the NESCBWI enough for awarding me the Ruth Landers Glass scholarship for my YA manuscript. And apparently it’s perfectly acceptable to blurt out, “SHUT UP!” when they announce your name. Just in case anyone was wondering. Thanks to Betsy Devany for snapping this awesome photo of me with Marcela Staudenmaier, who won the Ann Barrow scholarship for illustrators! There is nothing like the Rutgers One-on-One. This conference for children’s writers, held yearly in October, is the place to see and be seen. The one-on-one ratio means that attendees get to rub elbows with as many agents, editors, and published authors (the mentors) as other (likewise awesome) mentees. Your One-on-One. You get 45 minutes (45!!) alone with your mentor, who is either an editor, agent, or author. That morning, the mentors receive your 3-page sample you subbed to get into the conference, and you can spend time walking through that, through your manuscript as a whole, or talking about other projects, your query letter, or whatever else seems the best use of the time. My mentor in 2008 when I attended for nonfiction was an author, and I had an editor this year for YA fiction, and both of them were absolutely amazing. The importance of not writing to trend–just write a good story. The dystopian wave has crested, but some paranormals and dystopians are still in the works–they just have to have a very different angle (or combination of genres, like dystopian historical). Submit your very best work. The panel discussion. Again, more great insights from a team of authors and publishing professionals. Mentees could email questions in advance, and agent Marietta Zacker, who moderated the panel, did a great job hitting as many bases as possible with a selection of those questions. Lunch. Agents and editors remain at their tables from the Five-on-Five, and you can sit wherever you want. Here’s your chance to seek out others on your list you haven’t met! OK, I said 4, but the last opportunity you can use is the short breaks in between activities. You should never (never) try to approach someone in the bathroom line (NEVER), but if someone is alone at a table or edge of the room etc., they are fair game. This is the perfect chance to put your face to your name with someone you’ve queried, or just to say hello to someone you’ve had contact with, or admire from a distance. Don’t expect or try to initiate a long conversation, but if you have something short to say, this is a good time. One last piece of the enormous pie of awesomeness that is Rutgers is the chance to network with other amazing writers. Because you have to send in a writing sample to get accepted, you can guarantee that the other mentees are as serious (and as good!) as you. This conference is a great place to catch up with old friends and make new ones, and I simply cannot recommend it more! When it comes to the kids’ writing community, I can honestly say that I’ve never been to a bad conference, workshop, or retreat. I’ve always met cool people, learned new things, and given my writing a jump start. 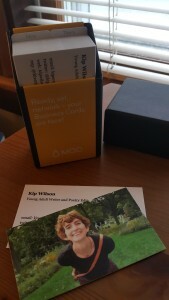 Smaller regional conferences: I’ve been lucky enough to attend a few smaller conferences, including a small one in Connecticut and two in Europe (one in Madrid, Spain, and one in Munich, Germany). The European ones are awesome because, um, they’re in Europe, but in general, I also really like the feel of a small group where you can get to know more attendees and get to chat with agents, editors, and authors in a more relaxed setting. 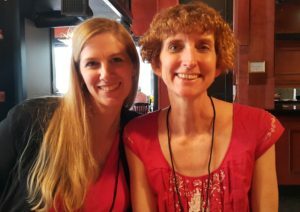 I would definitely attend any and all of these again, and I still look forward to going to many others I haven’t gone to yet: SCBWI NY, SCBWI LA, Chautauqua, Whispering Pines … the list goes on! What is your favorite conference or retreat?